Ram is closing one chapter and opens the second right away. The new-generation Ram 1500 is basically a done deal. The half-ton truck will be introduced early next year at the 2018 Detroit Auto Show, but it’s ready already. This is why the manufacturer started testing something new and bigger right now. More precisely, a testing mule of the 2019 Ram 2500/3500 has been spotted for the first time a few days ago. The Heavy Duty workhorse is completely camouflaged, so we can’t figure out what’s happening beneath. However, the latest reports suggest that there will be plenty of changes inside, out, and under the hood. The redesigned 2019 Ram 2500/3500 will reportedly stay without the 5.7-liter V-8. This makes sense because the upcoming 1500 model won’t feature the engine. This leaves the more potent 6.4-liter V-8 the only option. Well, maybe, but we highly doubt that Ram doesn’t have anything new in mind. No, they are likely working on something new, which will be ready for the arrival of the all-new Heavy Duty. As for the 6.4-liter mill, it’s going to deliver 410 hp and 429 lb-ft. The large truck will not stay without a diesel option of course. The oil-chugging option is going to use a 6.7-liter turbocharged inline-6 from Cummins, which will enable hauling capacity of over 30,000 thanks to a whopping torque. The twist should be limited to 930 lb-ft. In contrast to the gasoline model that’s going to be paired with an updated version of an eight-speed automatic transmission, the amazing diesel should use an Aisin 6-speed automatic gearbox. Since we are looking into the testing mule, we can’t really figure out what’s going to happen beneath. Still, according to the latest reports, the camouflage hides all-new proportions and chassis. The large truck will reportedly become even larger, while the overall curb weight should be reduced because the bodywork should host a higher level of lightweight materials. 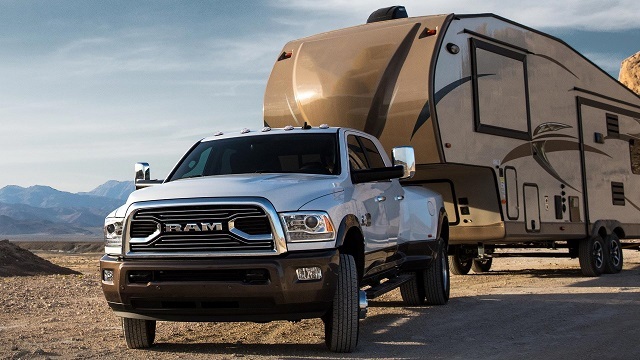 Both exterior and interior will feature plenty of styling changes, which will likely have a lot in common with the smaller Ram 1500. Of course, the cab will use better quality materials and new upholstery. Plus, we expect the new infotainment system and updated or even all-new safety suit. The 2019 Ram 2500/3500 will be introduced in two years, most likely at the 2019 Detroit Auto Show. The large pickup truck will definitely cost more a bit more than now, probably around $37,000.